The majority of readers voted for buying a Prius. Under other conditions, they may be right. Based on $5.00 gasoline, $0.40 per kWh electricity, 10,105 annual miles, 20/80% highway/city driving, and the availability of the $7,500 Federal and the $5,000 California, tax credits for EVs and PHEVs, it takes a Toyota Prius HEV almost 16 years to breakeven from fuel savings relative to a Toyota Corolla. The EVs and PHEVs in the study do not even remotely come close. Since the average car life is roughly ten years, this result is discouraging. Under these conditions, it makes the most economic sense for my family to purchase a Toyota Corolla. However, this is not the end of the story by any means. Tomorrow, I will run the numbers again for a range of gasoline prices and annual mileage. Click here for the next installment of this series. This entry was posted in Business, California, Clean Energy, Clean Tech, Climate Change, Energy Security, Finance and Economics, Investing, Predictions, Taxes and tagged BART, California, Chevy Volt, Corolla, EV, HEV, ICE, Leaf, Nissan, PHEV, Prius, Roadster, Tesla, Toyota. Bookmark the permalink. Better Place is doing a great job of helping to mitigate the range problem of electric vehicles and hopefully, by also using electric vehicles as batteries connected to the electric grid, can also lower electricity prices. 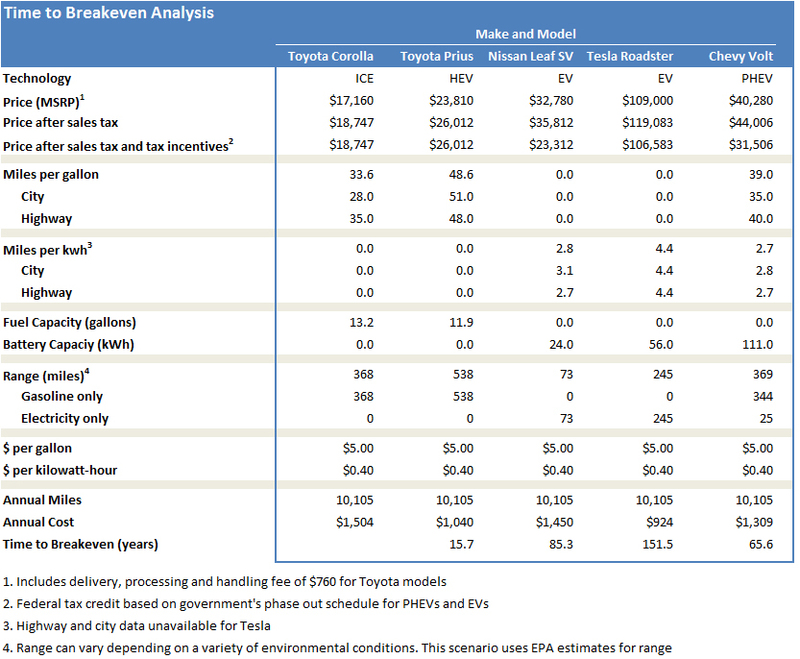 EVs may actually work for some North American localities. Unfortunately, given PG&E’s rate structure in Northern California, the SF Bay Area is not one of them.